In a slight change of direction for the HPL (and thank you to the gorgeous Lady B and assorted friends for the idea) I am starting a new monthly competition where you, lovely readers – and may I say you look simply STUNNING today – get to contribute on what makes you happy in London; win free stuff as a result; AND the opportunity to write a little guest post for the HPL at the end. So, in January I’ll be asking what makes you happy post-Christmas break when you feel fat and cold and I’ll be asking suitable venues to cough up free tickets/treats to the person who comes up with the best suggestions. In February, around Valentine’s Day, I’ll be asking what is the best date-night in London and the most interesting (preferably saucy) responses will win a great prize. And I’ll be sharing all your suggestions and mine on the blog and will only ask the prize winner to let me know if they enjoyed their prize and their thoughts on it, for a guest blog post (sending me a quick email is fine too, don’t worry). So HPL readers who have nice prizes that they can offer, get in touch (I’m looking at YOU). For December, the HPL is thinking about cold, rainy, dark weekends and catching up with friends before we all set off for Christmas and drinking / eating far too much. I’m thinking warm pubs and sharing plates and pints. So this month, the HPL has two pairs of tickets to the launch event for Mason & Taylor, a new bar/drinking den opening this December in the East End (Bethnal Green Road), on Thursday 9 December 2010. Here’s some blurb about the pub: It has been set up by the founders of the award-winning The Duke of Wellington in Dalston. And I’m excited because the founders include Ed Mason who opened various venues in Leeds including The Faversham (The Faversham! 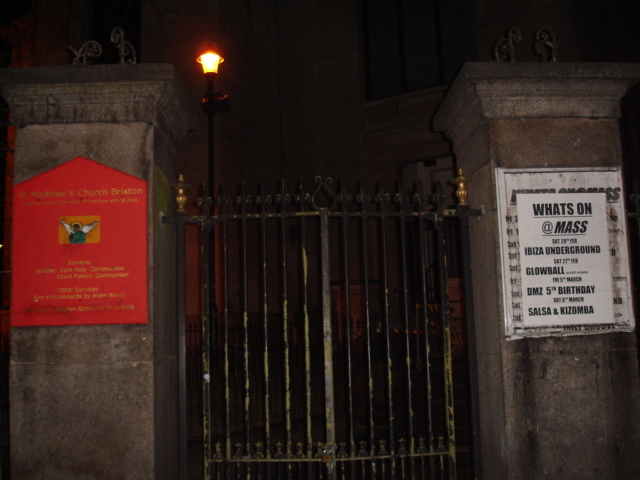 My second home at Uni, venue for drunken attempts at The Worm on breakdancing nights, and having to climb out of my flatmate’s boot in a very short dress because his car doors didn’t work). It will sell craft beers, spirits, authentic cider and English wine (interesting) and serve classic British sharing dishes like rabbit & crayfish terrine with pea puree & shoots, York ham, poached duck egg and parsley sauce, ginger beer battered squid and pickled ox tongue. Yum. If you fancy winning tickets to the launch night then the question is this: What makes the perfect winter Sunday lunch? Send me your responses by Friday 26 November either on the HPL facebook page or on twitter (@happyprojectLDN) or as a comment to this post. I’ll pick my favourite two and you’ll receive a pair of tickets each. I’ll also be there to say hi (will be the blonde invariably propping up the bar – purely for research purposes). And feel free to look at the HPL section on best places for Sunday lunch for inspiration. I’ll start. 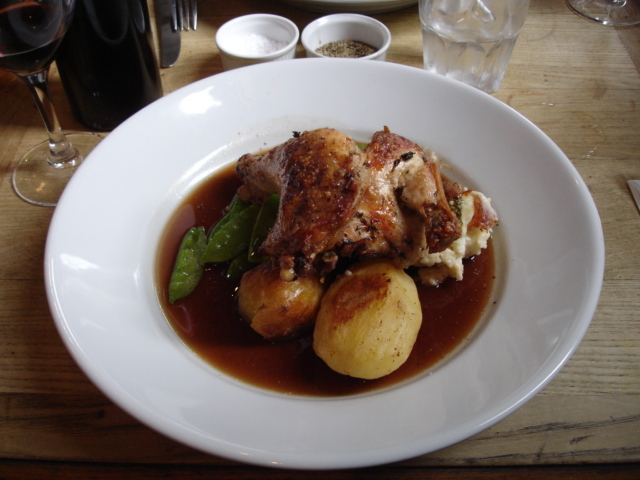 My perfect winter Sunday lunch would be somewhere like the Drapers Arms or 32 Great Queen Street or the Canton Arms. It would involve a big group of friends, old friends and good ones, who I don’t need to spend time catching up with or finding out how they are. We just settle into jokes and taking the piss straight away. People arrive late and laughing and hungover from a Christmas party the night before. There is a lot of gossip and funny stories, including inappropriate snogging and dance-offs at work parties and similar. We start with pints of cider, mumbling about irresponsible Sunday drinking, then order a sharing plate of beef with all the trimmings. We go on to red wine. Everyone is happy and red-cheeked and we might even swap presents. We stay too long, drink too much. We get overly affectionate and hug and go home, smiling, even through the Monday morning sore head. 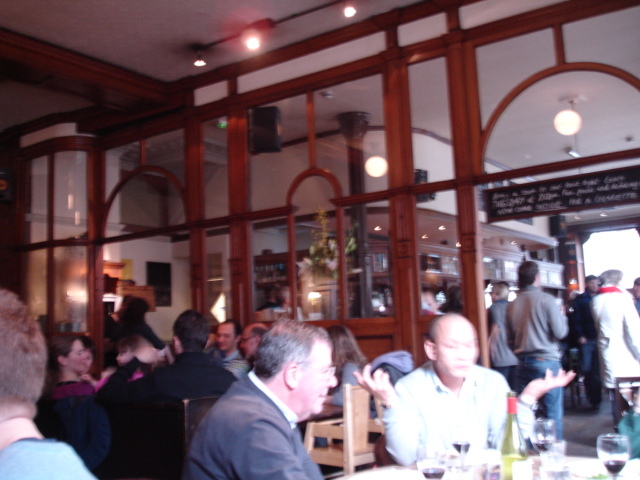 One of my favourite things about London is traditional old boozers especially when combined with Sunday lunch. 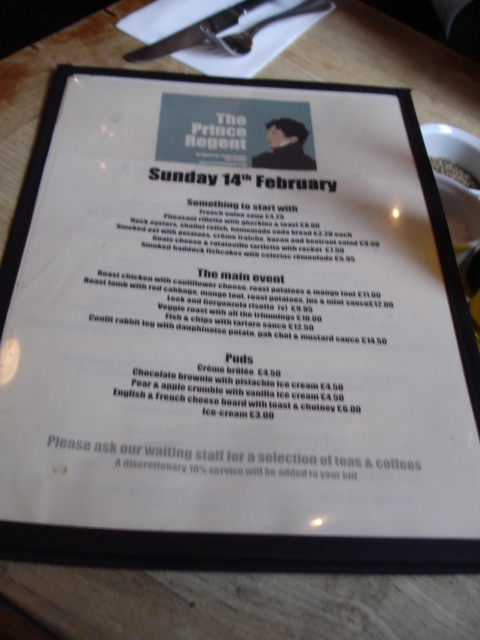 We’d passed The Prince Regent in Herne Hill a few times – its just by the lido at Brockwell Park – and it looked lovely, so Valentine’s Day was a good excuse for El G and I to try it out. No heart-shaped foodstuffs here thank god. Inspired by my friend Pip’s recent food photos, I took my camera for the first time since I started this blog – my point and press as the SLR would be too noticeable. No-one blinked an eyelid and even El G didn’t seem to mind (as long as it was sans flash) so I’m hoping to take more photos (hopefully a bit less blurry) from now on. 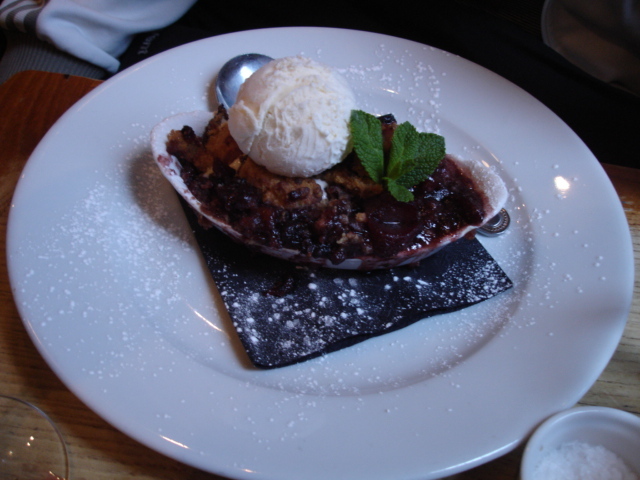 Here was the menu – brilliant choices like pheasant rillette for starter; roast chicken with cauliflower cheese, roast lamb with red cabbage or roast duck with celeriac and pak choi for main; cheese platter or creme brulee or apple and pear crumble for pud. 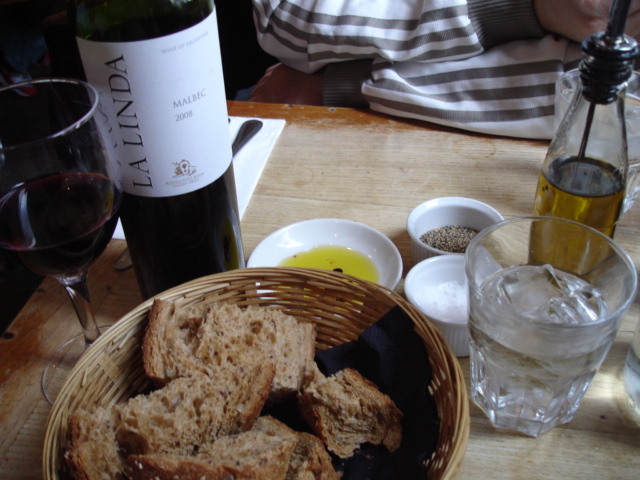 Good wine list too and we ordered a delicious bottle of Malbec for £15. 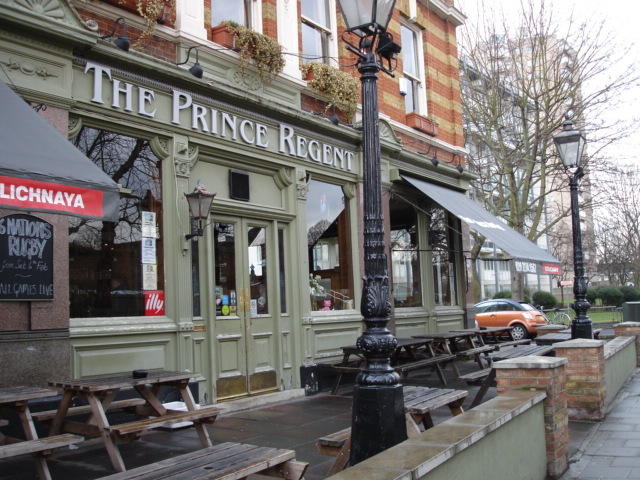 It reminded me more of a North London boozer (like The Scolt Head in Dalston) than other pubs in Clapham or Brixton because it was filled with kids and people of different ages (even people over 35! Gasp!) – which I reckon makes for a great pub. 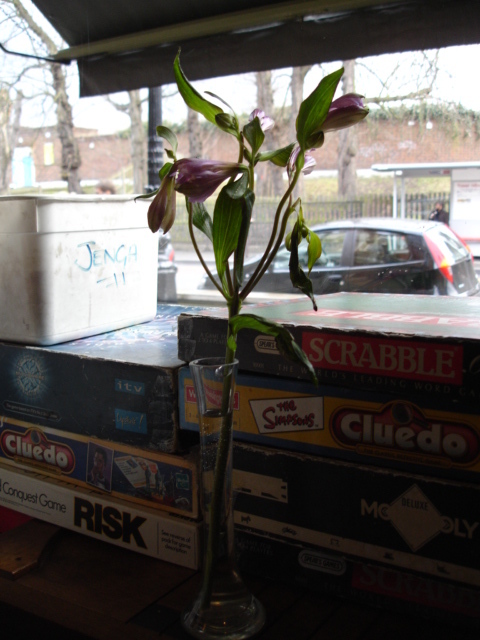 It was pretty full so we were pleased we booked – all rustic wooden floors and tables, church pew seats and noise – love it. 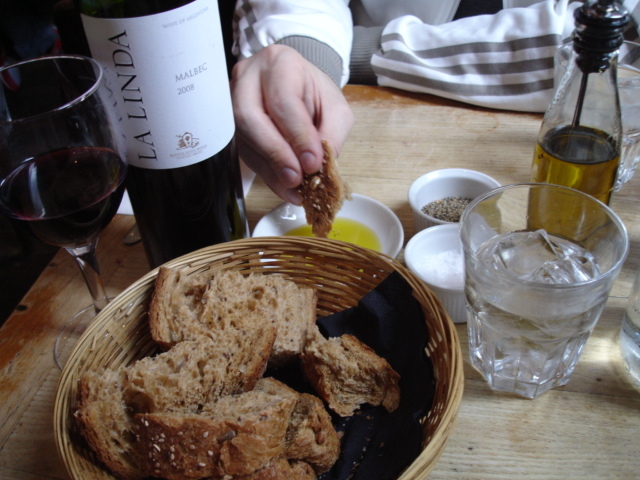 We started off with delicious bread and I loved the oil and balsamic in empty schwepps bottles. Then the mains arrived – my chicken was delicious, with a generous portion of cauliflower cheese (guilty pleasure from childhood), roast potatoes and mange tout, my only minor comment being the meat was a little bony. 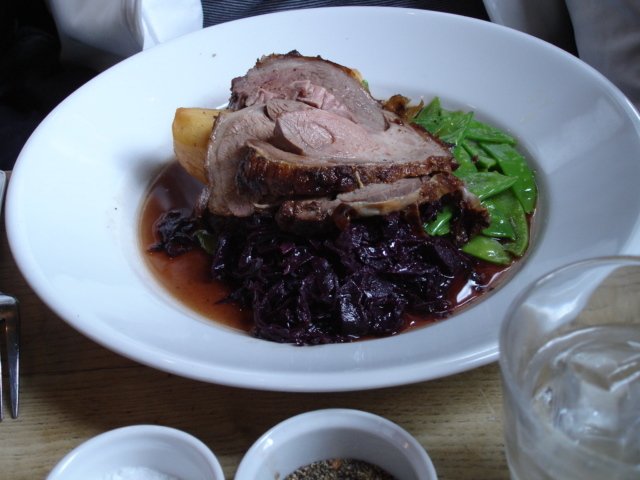 El G’s roast lamb was succulent and delicious, with spicy red cabbage. 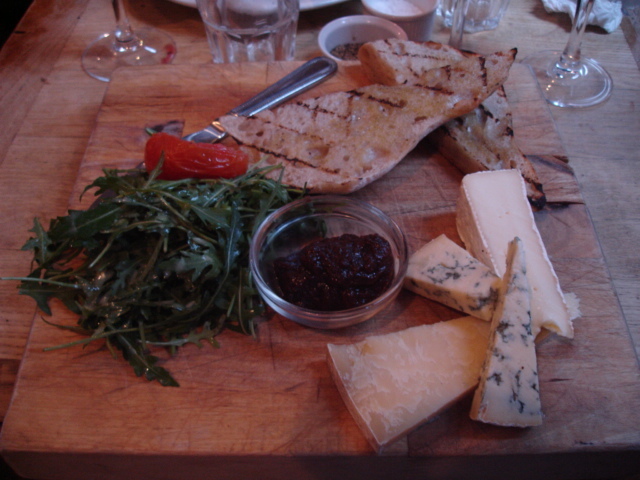 Both of these mains are better – great flavours, more interesting – than normal pub grub I’ve had in this area. At £30 a head for 1 main, 1 pudding and 1/2 a bottle of lovely wine and a bit more hic each, considering the quality of the food and the fantastic atmosphere, this was a really great pub lunch. I’m definitely coming back – both in Summer to sit outside, with a group of mates to take advantage of the church pews and for the pub quiz. Next time I’ll try the roast duck and finally convince El G to play Risk. 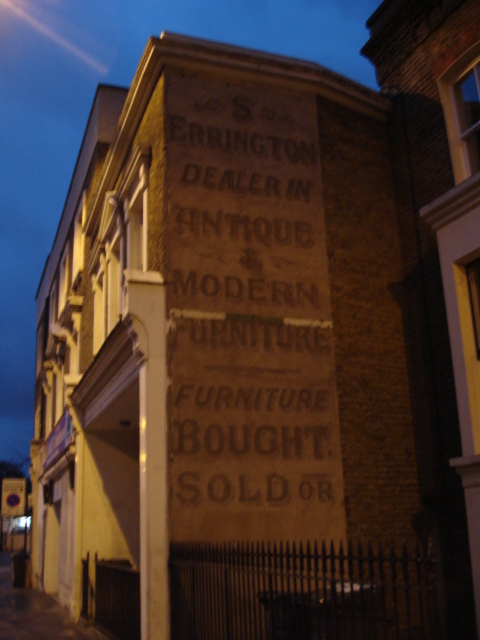 On the way back to Brixton I took these two shots – an old furniture advert and a sign for St Mathews Church next to an ad for DJs playing at the club Mass under the church. Only in Brixtonia.